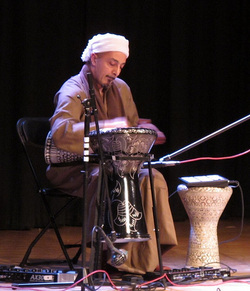 Drummer and Egyptian tabla player (dumbek), George’s musical journey took him through Middle Eastern music, Jazz, music of the Arabian Gulf, the Balkans, and his niche and first love-Egyptian music of his native land. Growing up as a drum kit player, George had a chance to learn several styles of music that did not necessarily use the Egyptian tabla which helped broaden his approach to composing tabla grooves. As a teenage, George performed in international clubs around the Northwest during the 80s. In the 90’s he relocated to LA where to performed in international shows and was a studio session artist. George performs around the Northwest with several lineups. He started the Anubis Nights concept in 2011 ; a music and dance variety show that s Middle Eastern music and Belly Dancing based but includes a variety of World Music, Jazz among other genres . Currently Anubis Nights is the only music and dance show running weekly every Friday and Saturday , our current home is Harissa .